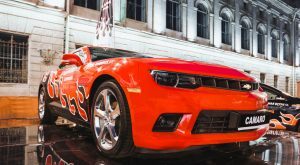 As we near the end of the third quarter, General Motors Company (NYSE:GM) — my pick in InvestorPlace’s Best Stocks for 2017 contest — is putting up a respectable fight. But will it be enough to win? That’s a tougher call. As I write this, Louis Navellier is leading the pack with a 62% return in Nvidia Corporation (NASDAQ:NVDA). But Matt McCall and Brett Owens aren’t far behind, with returns of 47% and 42%, respectively, in Albemarle Corporation (NYSE:ALB) and CoreSite Realty Corp (NYSE:COR). So, in order for GM to win, the shares would have to go a lot higher in a very short period of time, or three stocks in three different industries would all have to collapse between now and year end. Well, you can’t win them all. But if you’re looking for a stock to hold for the remainder of 2017 and beyond, I still consider General Motors to be a very good bet. Doing a true Shiller P/E requires 10 years of data, and GM was reorganized only in 2010. Though Benjamin Graham, who invented CAPE methodology decades before Robert Shiller looked at it, recommended using between five and 10 years’ worth of earnings data, so we’re fine here. Now, let’s consider the dividend. At current prices, GM sports a dividend yield of 3.9%, roughly double the yield of the S&P 500. That’s a nice yield in this market. And given that GM’s payout ratio is a very modest 24%, I consider that yield safe. GM has raised its dividend a cumulative 27% since 2015. That’s respectable dividend growth to be sure, and given the low payout ratio, I expect a lot more to come. So, what are GM’s prospects like going forward? If you believe the media narrative, Millennials aren’t interested in car ownership and prefer to live in urban areas with public transit. Well, that was true when the Millennials were fresh out of college, broke and single. But as the Millennials get settled into their careers, get married (or at least move in with their partners) and have children, they’re starting to look a lot like their parents. And you can only expect that trend to continue as they age. That means a lot of SUV and minivan sales in the years ahead. I’m not throwing in the towel yet on the Best Stocks contest. But win or lose, I still consider GM a fabulous stock to own at current prices. Article printed from InvestorPlace Media, https://investorplace.com/2017/09/best-stocks-general-motors-company-gm-stock-warming/.